Surfer’s ear is a term given to a condition of the ear canal when it becomes either partially or totally blocked by prominences of bony tissues (exostosis) grown from under the skin lining of the canal. Why do these Growths Occur? Over time when a person’s ears become over exposed to cold conditions and cold water, irritation can occur and as a consequence the delicate lining of the ear can become irritated, causing over production of the bony substance found under the lining of the ear canal. As surfer’s are continually exposed to high winds and cold water, they are often the group of people to suffer the most from this condition, though it is not limited to this group of people, hence the name surfer’s ear. As the growths within the ear canal develop, hearing loss usually becomes more and more noticeable as the passage through the ear becomes restricted.Wax may begin to build-up as it becomes harder for it to be naturally excreted from the ear and infections are more likely to develop and last longer, as fluid and wax become trapped and infectious materials cannot drain away as they normally would.It is normally the hearing loss or repeated and prolonged infections that cause the person to seek medical help, and this is often when the diagnosis of surfer’s ear is made. Most ear health specialists will recommend a procedure called an exostectomy, which involves making an incision traditionally behind the ear, and using special instruments to remove the bony growths from the canal. Modern techniques may now indicate direct entry through the ear canal, though this is considered by many to carry a higher level of technical expertise.Wax debris may be cleared away, and anti-biotics may be indicated if infection is present.Following the operation high levels of co-operation are expected as you will be advised to refrain from participating in any water sports for at least 6 to 8 weeks to allow for healing and the overall success of the procedure. As with most medical conditions, prevention is better than cure and in order to try and prevent this condition the use of ear plugs may be necessary or a swimming hat that covers the ears. Speak to your surgeon for advice on suitable earplugs that will aim to protect your ears.Alternatively try and avoid prolonged exposure to cold weather conditions and submersion into cold water.As the bony growths may grow back following surgery, it is highly recommended to find a suitable preventative method in order to protect hearing function. 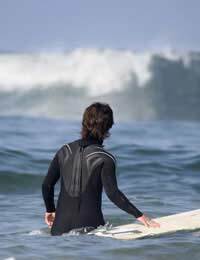 Surfer’s ear is a term given to those who have developed bony growths protruding into their ear canal following over exposure to cold water and cold weather conditions. It can be painful, cause hearing loss and can be prevented by protecting the ears using ear plugs or equipment designed by surfers to be worn when participating in water based activities.It is important to consider these preventative options as hearing loss can deteriorate and become very reduced and over time can become so pronounced that treatment options will be significantly reduced.